, corresponding to C terminal amino acids 611-623 of Human CHFR. Our Abpromise guarantee covers the use of ab13773 in the following tested applications. Belongs to the CHFR family. Contains 1 PBZ-type zinc finger. Weakly expressed in G1 phase, and highly expressed during S phase. The PBZ-type zinc finger (also named CYR) mediates non-covalent poly(ADP-ribose)-binding. Poly(ADP-ribose)-binding is dependent on the presence of zinc and is required for its function in antephase checkpoint. The FHA domain plays a key role in the anti-proliferative properties of the protein and is involved in initiating a cell cycle arrest at G2/M. The FHA domain may be required to interact with phosphorylated proteins. Poly-ADP-ribosylated. In addition to binding non covalently poly(ADP-ribose) via its PBZ-type zinc finger, the protein is also covalently poly-ADP-ribosylated by PARP1. Autoubiquitinated; may regulate its cellular level. Phosphorylated upon DNA damage, probably by ATM or ATR (By similarity). Phosphorylated by PKB. Phosphorylation may affect its E3 ligase activity. ab13773 (2.5 µg/ml) staining CHFR in Human Brain (Cerebellum) by IHC-P. Steamed antigen retrieval in citrate buffer pH6, AP-staining. 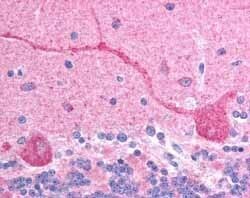 This image shows stained Purkinje cells in Cerebellum. ab13773 has not yet been referenced specifically in any publications. Publishing research using ab13773? Please let us know so that we can cite the reference in this datasheet. We recently got in the lab an anti-CHFR we ordered some weeks ago (ab13773). The requested antibody is raised in goat. In our hands, goat antobodies are not so efficient as rabbit or mouse antibodies. We realised today you already have an anti-CHFR raised in rabbit (ab4184). I would like to know whether we can exchange the goat ab we got for the rabbit one. On the other hand, we are starting a new lab, and making a big list of antobodies we need. Many of them are availble from you. We would like to know whether we can deal a special price if we request several antibodies in the same order. Looking forward to contact you. We will take back the goat antibody (ab13773) if you send it back at 4 deg C and cover the cost of the shipping plus a 20% re-stocking fee. A credit note for the original order minus the 20% re-stocking fee will be generated once the product is received by Abcam in packaging at 4 Deg C. Please let me know whether you wish to return the product to us. However, please remember that if our products do not work as we state on the datasheet we will gladly send you a replacement vial of the same or an alternative product so it may be worth your testing the goat antibody first, and if it doesn't work as we say it should, we'll send you a replacememt of ab4184. We do offer discounts if customers wish to order many vials of the same product or if many products are ordered at the same time. Please let me know which products you wish to purchase from us and I shall advise whether we are able to offer you a discount. What are the exact conditions for using the CHFR antibody in order to visualize the 80 kDa band on a Western blot? The following protocol using ab13773 at 1 ug/ml and 0.5 ug/ml both gave a 80 kDa band in Human Brain lysates: - SDS PAGE. Samples were run at 200V constant on a 12% acrylamide SDS-PAGE mini gel - using Biorad Mini-Protean 3 kit and protocols. Before loading samples had 5% (v/v) 2-ME added and were boiled for 3 minutes. - Transfer. We used a Biorad Mini Trans-Blot, constant 100 V for 1 hour. Transfer Buffer was 20 mM Tris pH 8.0, 150 mM Glycine, 10% Methanol. We transferred to Millipore PVDF membrane and stained with Ponceau Red to evaluate the transfer. - Staining. The membrane was blocked in 2.5% skimmed milk in TBS-T (TBS + 0.05% Tween-20) for 1 hr at room temperature with agitation. Primary antibody was incubated for 1 hr at room temperature with agitation. We used sigma secondary (Sigma anti-goat-HRP Product # A4174, use 1:3000) for 1 hr at room temperature with agitation. We washed with TBST three times after primary and secondary antibody, each wash lasting for 5-10 mins. ECL-plus (Amersham) was used rather than ECL, which is considerably more sensitive. Final detection was on autoradiography film. As ab13773 is a Fast-Track antibody, we will award $300 Conference Travel Money to 1st researcher who submits positive or conclusive negative data. For more information, please see the online datasheet. If you have any more questions, please do contact us again.